The only thing more Mexican than tequila is mariachi and it seems a shame to have one without the other. Mariachi goes beyond music; it is the sum of a cultural revolution expressed through a group of musicians, dressed in popular clothing (most recently charro suits) which encompasses the essence of Mexico and its people. It is something cultural, spiritual and traditional that is unique to this country, an experience not to be missed. The word mariachi refers to the musicians now commonly seen in restaurants or strolling the streets, dressed in silver studded charro outfits with wide brimmed hats playing a variety of instruments which include violins, guitars, basses, vihuelas (a 5 string guitar) and trumpets. The mariachi originated in the southern part of the state of Jalisco sometime in the 19th century. No one is sure where the name comes from although a variety of theories have been postulated and, depending on which best fits the postulators needs, are adhered to. Today, mariachi music is played around the world in places as far away as Japan and Europe. 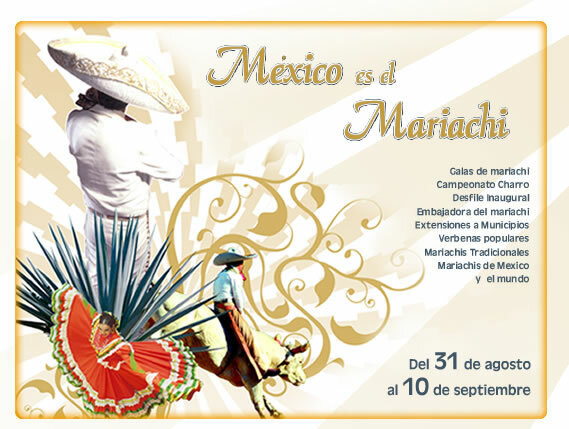 This integral part of Mexico's culture and history is celebrated each September in its birth place, Jalisco. If you are planning on a trip to Mexico, more specifically to Guadalajara, don’t miss the opportunity to experience the “13th Encuentro Internacional Del Mariachi y la Charreria” which will be celebrated in Zapopan from August 31 to September10. It is an International event where Mariachi groups from Croatia, Cuba, Italia, Belgium, Chile, France, Argentina, Panama, Ecuador, Colombia, Australia, Aruba, Costa Rica, Canada and the United States Estates, gather to compete, share and celebrate the music of Mariachi.